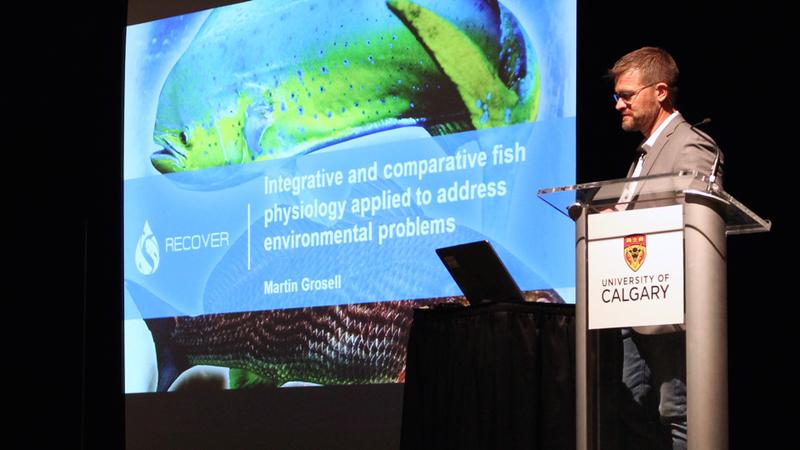 MIAMI-- University of Miami (UM) Rosenstiel School of Marine and Atmospheric Science Professor Martin Grosell received the Award of Excellence in fish physiology from the American Fisheries Society. The award was presented to Grosell during the 13th International Congress on the Biology of Fishfor his outstanding career contributions to the study of fish physiology. Grosell is the principal investigator and director of RECOVER(Relationships of Effects of Cardiac Outcomes in fish for Validation of Ecological Risk), one of 12 research groups awarded grants totaling $140 million by the Gulf of Mexico Research Initiative (GoMRI), a research board created to administer funding for independent research programs following the Deepwater Horizon oil spill in 2010. RECOVER scientists are examining the detrimental effects of oil on two ecologically and economically important species of fish in the Gulf of Mexico: mahi-mahi and red drum. Grosell has been a faculty member at the Rosenstiel School since 2002 where he specializes in environmental physiology and toxicology in marine fish and invertebrates. In 2014, he was appointed as the Maytag Chair, a fully endowed professorship of ichthyology at UM. He has published more than 200 peer-reviewed research papers, books and book chapters on the physiology and mechanistic toxicology of aquatic organisms. He received his MSc and PhD from the University of Copenhagen’s August Krogh Institute. “I am very grateful to my colleagues who voted in favor of awarding me the tremendous honor of this career award. The accomplishments leading to this recognition would not have been possible without the support of my home institution, my past and current students and postdocs, as well as a long list of US and international collaborators,” said Grosell. Grosell is also the editor-in-chief of Comparative Biochemistry and Physiology and serves on the editorial boards of American Journal of Physiology, Journal of Experimental Biology and Frontiers in Aquatic Physiology.